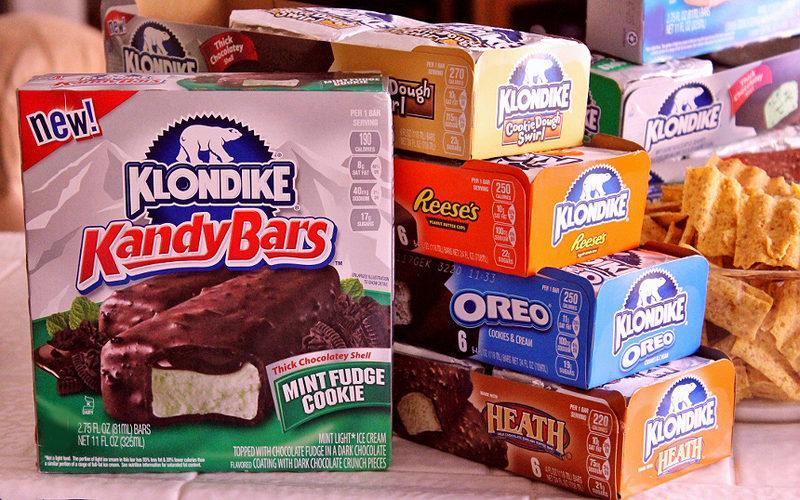 This #KlondikeVariety post was sponsored by Klondike as part of an Influencer Activation for Influence Central. I received complimentary products to facilitate my review. Momma Told Me: Give them what they want. You know what makes that fine line of a difference between a good host and an amazing host this Game Day season? It's not allowing the other team's jersey under your roof, or even hand folding buffalo wontons to look like miniature helmets. I'll let you in on a little secret Momma taught me; give them what they want. Game day may be a rough, tough, drag down and all out fight for superiority and dominance, but you can still be the hostess with the most without having to feel like you just ran 40 yards to get to the touchdown zone. It's simple, really- Just go to the store and stock up on all of your friends and family's favorites. The easier to consume without having to look away from the screen, the better. And you'll score extra points if you can manage to rustle up enough variety to please all the players on your couch this season. One thing that never fails to solicit a team cheer is ice cream. 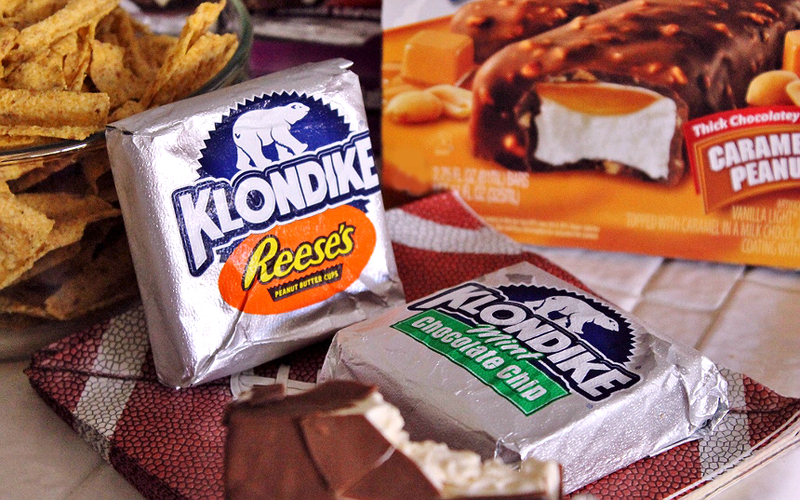 Available in 12 unique varieties of chocolaty covered squares and bars, Klondike is the winning pick to draft for all of your game day celebrations. Not only are these delicious handheld ice cream bars easy to munch on while taking part in the team wave, but you're sure to develop a new tradition, and garner plenty of praise when you set out an ice chest or tray topped with these silver wrapped smile generators. Never before has it been so easy to bring such a big snack time player to the lineup alongside traditional favorites such as pizza, buffalo wings, and carbonated beverages. And Klondike bars are anything but boring when you consider amazing flavors and branded varieties such as REESE's, Cookie Dough Swirl, and Mint Chocolate Chip. Shaking things up in the freezer aisle this season are Klondike's KandyBars, candy bar inspired ice cream bar treats, available in 6 packs, with flavors such as Cookies And Cream, Caramel And Peanuts, Fudge Krunch, and Mint Fudge Cookie. 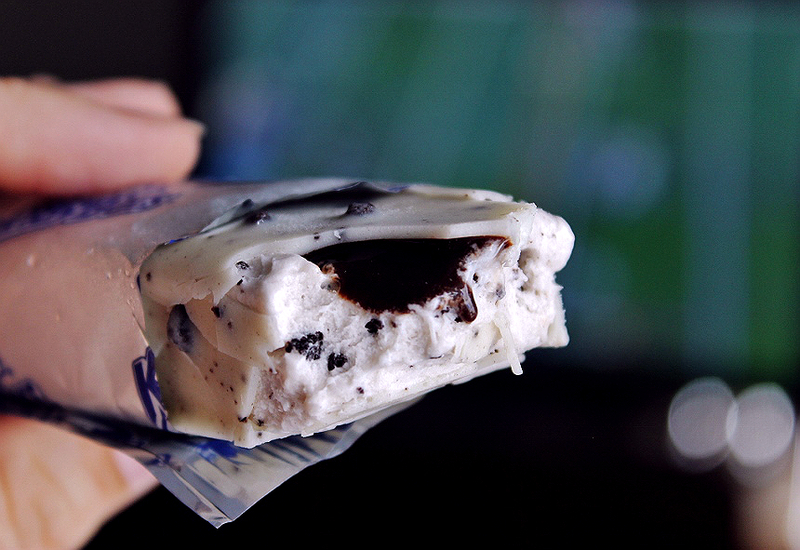 Yea, that's the Cookies And Cream Klondike KandyBars above- I'll just let you soak that in for a second. 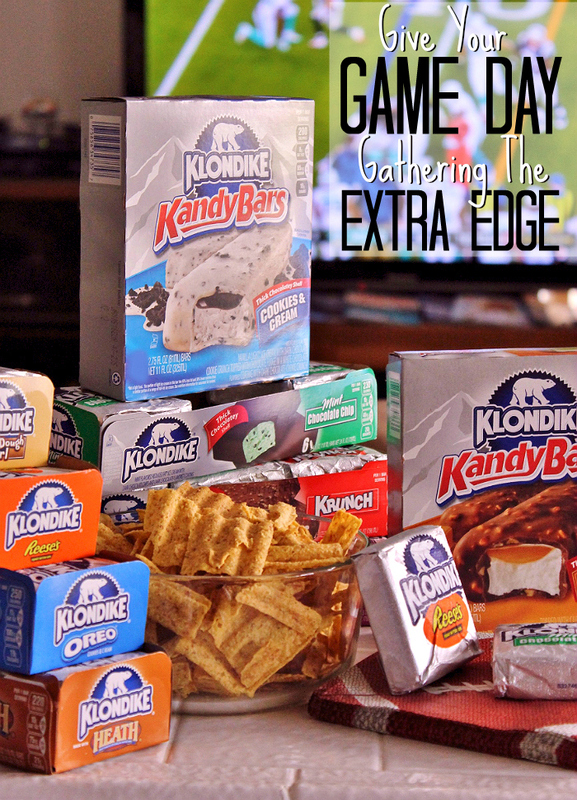 Klondike KandyBars are an all new way to discover and share the smiles of biting into a Knlondike Bar. 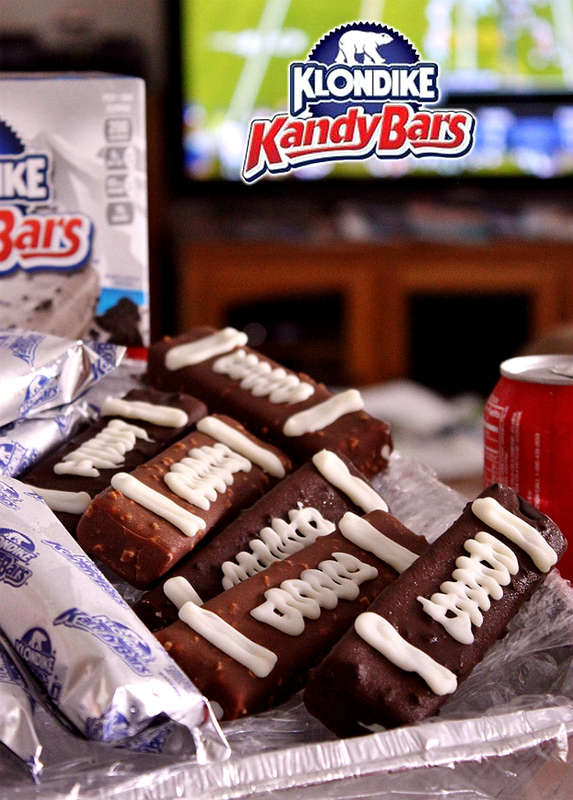 Their easy to open wrappers and unique candy bar shape make them easy to grab and go, or even enjoy while watching the big game. We love to let ours sit out for just a minute or two at room temperature before biting in to get that gooey sweet layer of flavor, just beneath that krunchy chocolate shell, the perfect consistency. Of course I couldn't help but noticed that these KandyBars were suspiciously shape like a game day icon, the football. So I decided to grab some piping chocolate and scribble some quick threading onto a few of my KandyBars for a recent game day event. After tossing them over ice, with some in wrapper bars (for those who prefer to enjoy a less hands on experience) I placed the tray out with all of the other snacks and grub. It turns out I didn't need to store them over ice, because all 12 were gone in a flash! We didn't even have a chance to argue over whether they'd been deflated or not! Don't celebrate the season's sports as much as some? Klondike bars are the perfect satisfying treat for ice cream and chocolate lovers no matter the occasion or season. I dressed up a few traditional Klondike Bar varieties with some orange, red, and yellow, icing chocolate for the adorable result above! 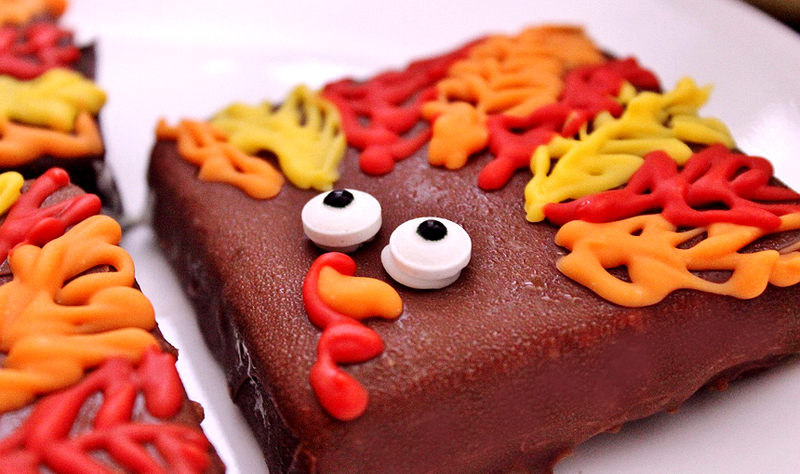 Who doesn't love enjoying some ice cream with their Thanksgiving pie? Why not put a trasy of Klondikes over ice out for your holiday guests this year? I grew up eating the original Klondike vanilla ice cream bars- and they always brough a smile to my face come dessert time. Momma loved them because they were pre-portioned, and contained in their own wrapper. No messy scoops or bowls to wash after. She'd simply send me out to the porch to enjoy my treat in the nice SoCal breeze. Now that there are 12 varieties to enjoy, every occasion is a Klondike occasion, and everyone in our family has their favorite variety. Do you serve ice cream or ice cream treats to guests at gatherings? What Daughter Says: Serve your guests an ice cream treat without the hassle or mess! 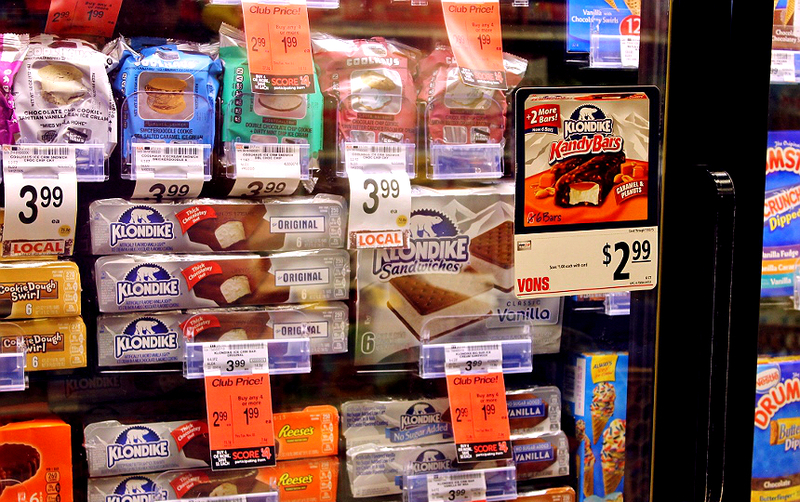 Are those Reese's Klondike bars that I spy! I NEED to get a box of those immediately!!! Oh I love Klondike bars! The Reese's are my favorite! I LOVE Klondike bars. I don't limit myself to certain days. I don't need that kind of restriction in my life. Bwahahaha. This is amazing! What a cute idea. I love Klondike bars, they are ridiculously delicious. I try to hold back sometimes, but it's just far too hard. I know a person that would take those Reese Klondike bars and devour them in one sitting! I LOVE the designs that are one them! How creative! these look adorable! 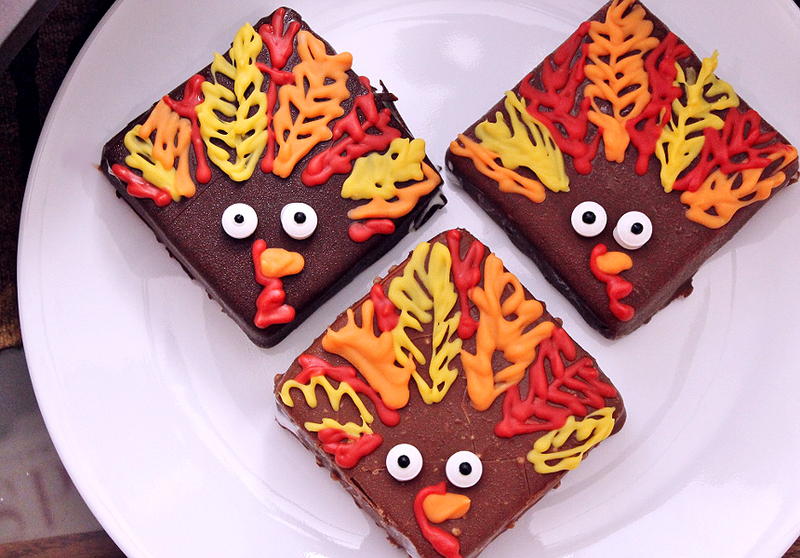 I have never thought of making a Klondike bar into a turkey, but it works so well, and I am sure it is delicious. I love how you decorated the Klondike bars. Who doesn't love ice cream. I wish we had a bigger Klondike selection here. 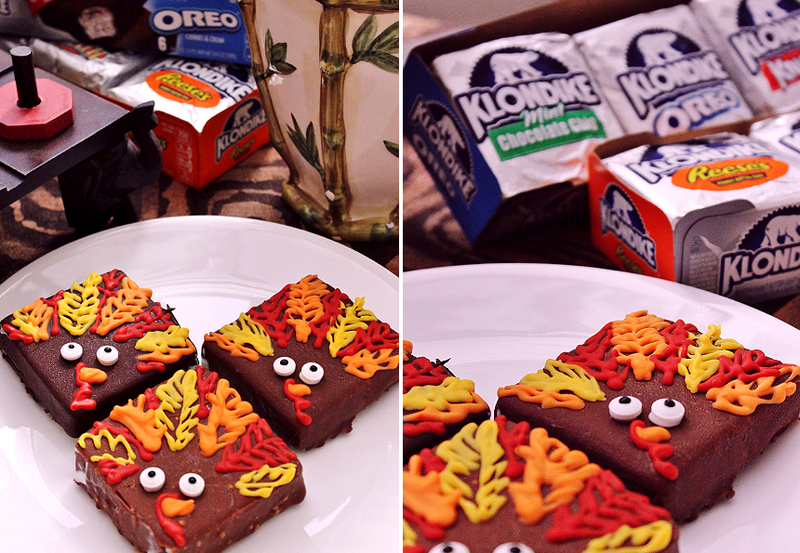 Oh my heart, those turkey Klondike bars are the BOMB! My kids would be all over them! And they are already crazy for Klondike bars. They are a fun special treat I usually pick up when we have company come over. So yeah, I totally serve klondikes for holiday guests! Those are so cute and I bet they are tasty! I would love one for myself. I love Klondike bars! They're so delicious. I love what you did with yours. That turkey is so cute! I may have to do that for Thanksgiving this year. I think these would be a huge hit with my family! Klondike bars are a family favorite! I want to try that cookies and cream, they look amazing! 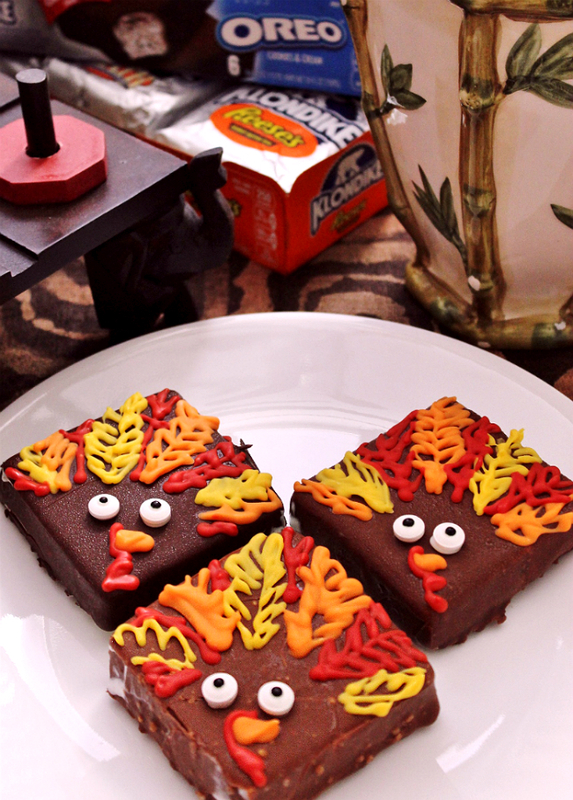 Love those cute turkey designs, too! Klondike bars are a family favorite of ours. My favorite is the Chocolate mint bars. I try to keep the freezer stocked up with all the flavors. 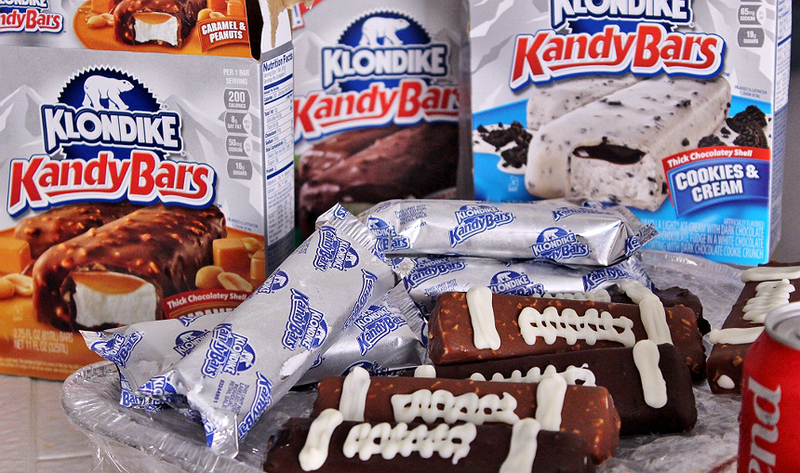 Mmm Klondikes are so good and they have so many varieties. I love those cute designs you made! You really went to town on this post creating clever Klondikes... that brand should HIRE you to design new products! I especially love your football and turkey designs. That's quite a lot of frozen treats there! You must have been working to take photos quickly! Klondike bars are my favorite! I have never met one I didn't like! Cute ideas. Oh what a great idea... and this totally takes me back to my childhood. I remember my Mom serving these to me and the girls at sleep overs. I will have to go pick some up. Klondike Bars are one of our favorite frozen treats. I love the turkey's. Super cute. Ok, those turkeys are DARLING! I am obsessed. What an inventive way to serve Klondike bars..I love this idea!